THEN: The spire of Gethsemane Church peeks above the tiled roof of a new Central Terminal in 1928. The terminal is nearly new in the photo by Asahel Curtis. The sidewalk awning blocks the full name of the eatery there. On the authority of a 1928 Polk City Directory, it's Terminal Cafe. NOW: The Lutherans have remained faithful to their downtown mission and survive at the corner of Ninth Avenue and Stewart Street, although from Jean Sherrard's point of view across Eighth Avenue, they are now hidden behind the greatly enlarged shelter for buses. By the summer of 1943 it became clear that German chances for a 1,000-year reign were dismal. Increasingly, war news encouraged thoughts of what might follow an Allied victory. For its part, the Greyhound Bus Lines began making plans for a postwar Helicopter Bus Line that would use the roofs of company bus terminals to also land helicopters. In Seattle it was soon after the war that Greyhound started paying the tax fees for the Central Terminal at Eighth Avenue and Stewart Street — with its big roof. Those who have sometimes traveled cheap into the hinterlands associate the city’s central bus terminal with Greyhound — the buses, not the ‘copters that never flew. I answered the Greyhound call here to board for Spokane or Portland or most often Bellingham many times from the late 1950s into the early ’80s. 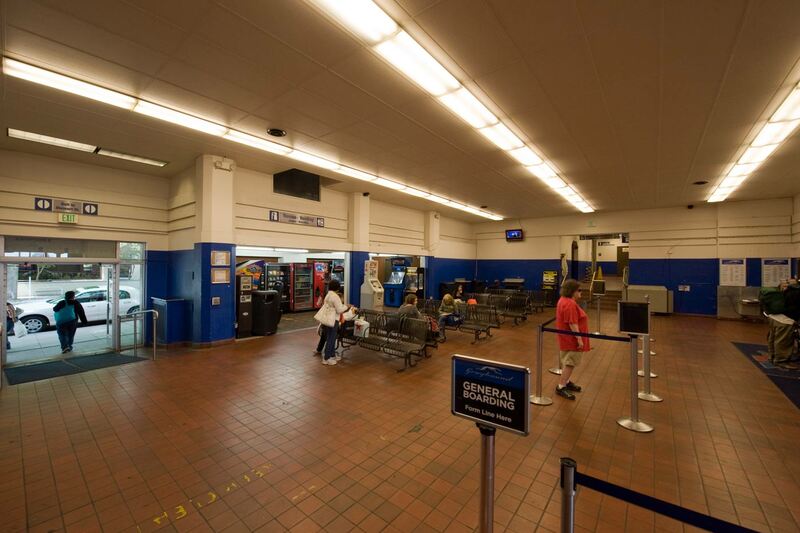 When this station opened in 1928, it was home for a new fleet of buzzing buses, and the Puget Sound Traction Light & Power company’s Seattle-Everett interurban rail line as well. The new, brick-clad, three-story station with a tiled roof was, in part, the company’s expression of confidence in the future of its interurban. 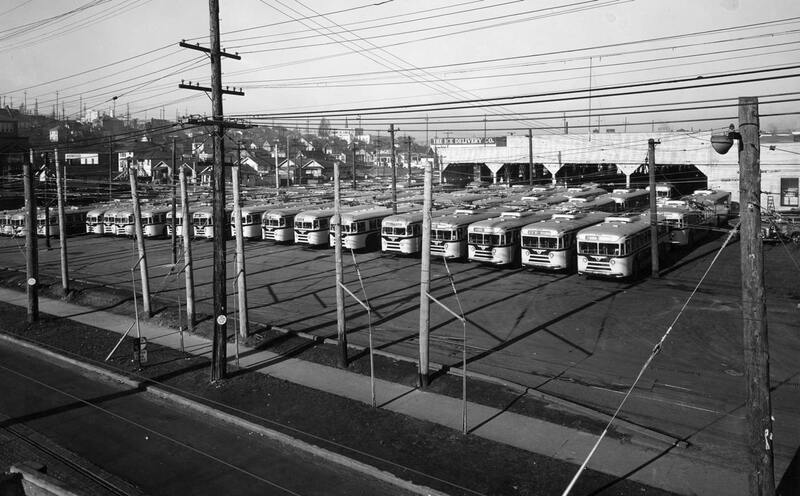 For 11 years more, this was a bus-rail depot, and a glimpse can be had of an Everett Interurban car on the far right of this depot scene. They stopped running in 1939. The Central Terminal got a remodel in 1947 (for Greyhound) and another in 1962, probably to complement the “forward look” of that year’s Century 21 world’s fair. Most of the textured bricks were hidden beneath a smooth, tiled surface, and more space was given to gaudy signs, increasingly plastic ones. Tell me it wasn’t always so, Paul. Are there gorgeous coves and domes hidden behind those ceiling panels? Terra cotta gargoyles and cupids lurking above? Or was it always thus? Jean lets imagine a high center waiting room ringed with murals on the history of wheeled transportation on all four walls with wonderfully cut windows shaping the ceiling to shed light on them. The top two floors in this fancy would feature a mix of offices and arts-crafts retailers and teachers with windows to the streets and balconies to the terminal waiting room. The pipe-in music would play traveling songs by Woody Guthrie and Schubert. But it was not so. The last time I used the terminal it had, I think, brightly colored plastic bucket seats. They were not designed for sleeping like the long wooded pews in the railroad depot. 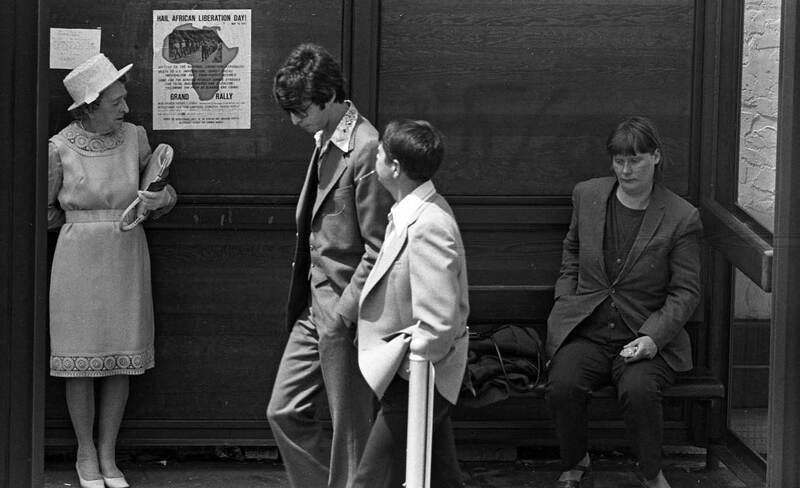 There was a sign on the wall, I remember, that advised, “Persons waiting for buses will kindly limit their reading to True Crime.” That said Jean, I still think your were a little hard on the floor. What follows are a few wheel-related subjects – local ones for the most part. First a look at another intersection that had a busy time once with transportation – the Seattle terminal for its interurban to Tacoma. In the scene above that is an early look at a Yesler Cable Railway Car and not a Seattle-Tacoma Interurban car. The text for the above then-now comparison appeared in Pacific - well I have lost track. Sometime in the last eight years. 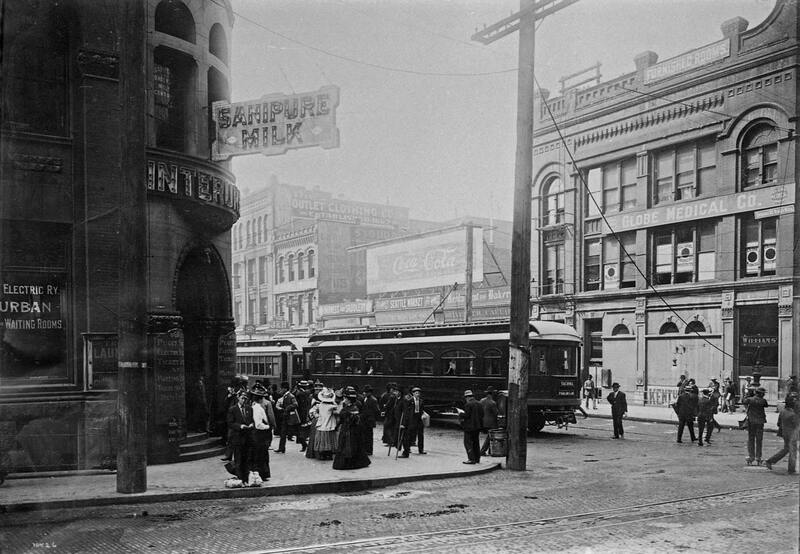 NOW-THEN CAPTIONS TOGETHER: After the Seattle National Bank Building at the southeast corner of Occidental Avenue and Yesler Way became the depot for the Seattle-Tacoma Interurban railway in 1903 it became popularly known as the Interurban Building. 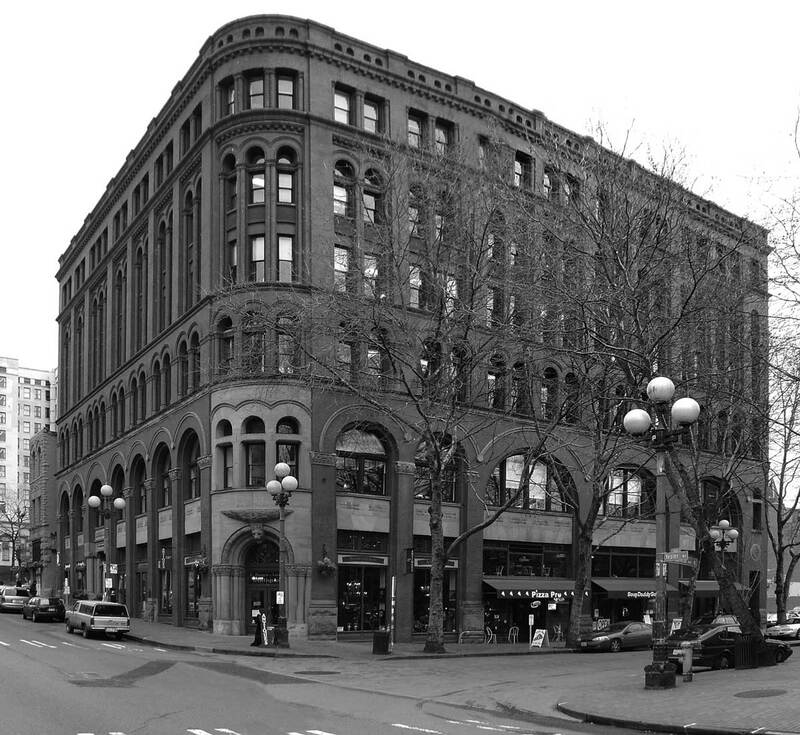 It is the name that is now preferred, although it has also been called both the Pacific block and the Smith Tower Annex. The most striking feature of this Romanesque landmark is either the Lyon over the bank’s corner front door or the building’s color: a coherent red from sidewalk to cornice. At its base Parkinson used red sandstone shipped from Colorado rather than the commonplace gray stone quarried in the Northwest and used by most of the bank’s neighbors. In this view a book and stationary store, Union Hardware, and the Wilcox Grocery all face Occidental Ave. The Queen City Business College is on the second floor, while the Washington Temperance Magazine, and several lawyers have offices upstairs. After a stint as the first official architect for Seattle schools, Parkinson left for Los Angeles where he had more than considerable success. Through his L.A. career the young architect grew old and counted both the city’s famed coliseum and city hall among his accomplishments. Looking south on First Ave (not Occidental) and across Yesler Way on July 27, 1927. 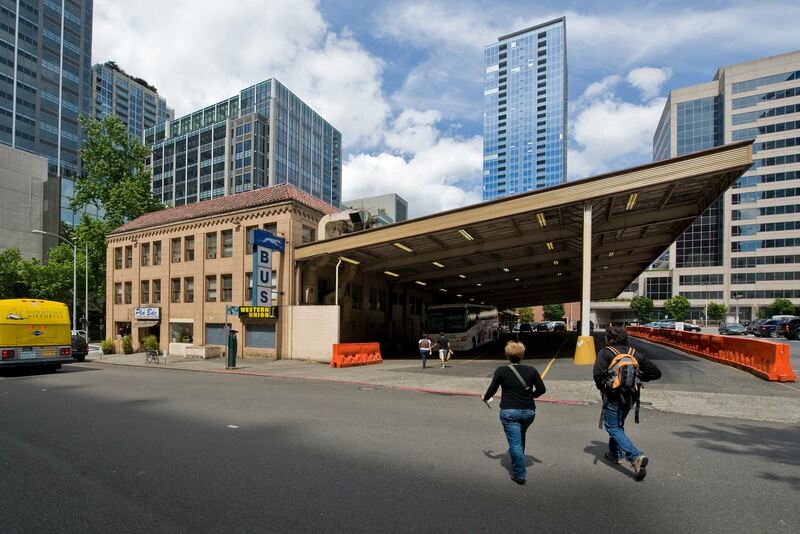 The Olympic Block (the old one) is on the left and a returning Interurban car holds the avenue. It will circle the block and stop at the Interurban Bldg. on Occidental (one block east) before returning to Tacoma. Thanks to L. Vine for correcting me on this. See the comments for this post to track, once more, another of my falls from grace, yes even from the bottom step. I pleaded lack of sleep. I may now return to doing watercolors. 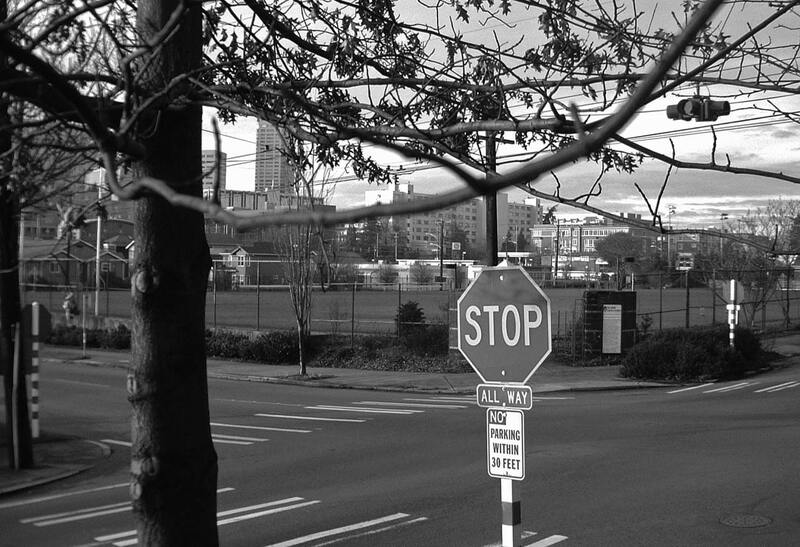 I follow with some small atonement with real photos of Occidental Avenue including a few glimpses of the Interurban Building. Inside the first class interurban 58 pillowed seats comforted riders who paid an extra quarter over the regular 60-cent fair. Although these parlor cars were the same dark green color as the rest of the Puget Sound Electric Railway’s rolling stock, they were obviously something special, complete with an enclosed view from the observation deck. 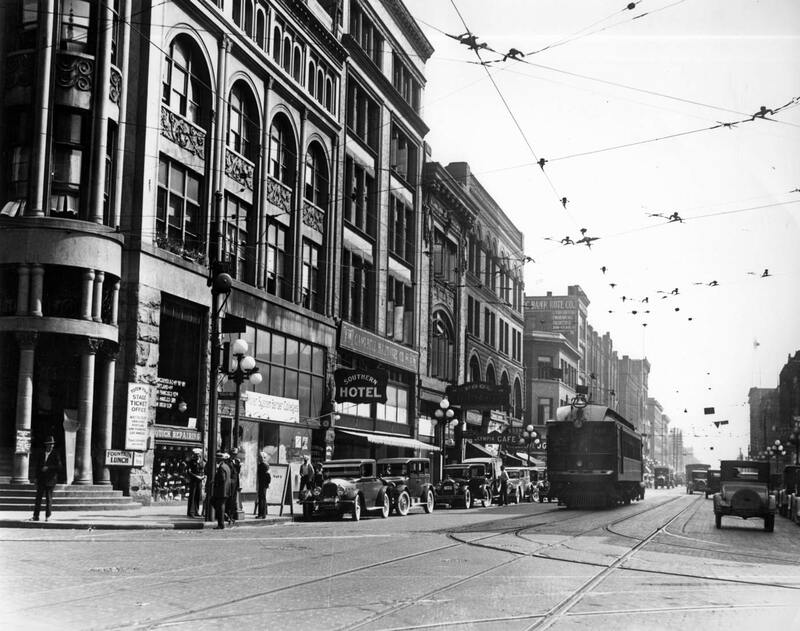 Looking north on Occidental from Washington Street with an Interurban car (right of center) holding station near the middle of the street. When the Interurban started service in 1902, the automobile was still a sporting novelty for the well-to-do. The practical and preferred way of getting to and from Tacoma was via the Mosquito Fleet steamers that buzzed about Puget Sound. The second choice was via rail. 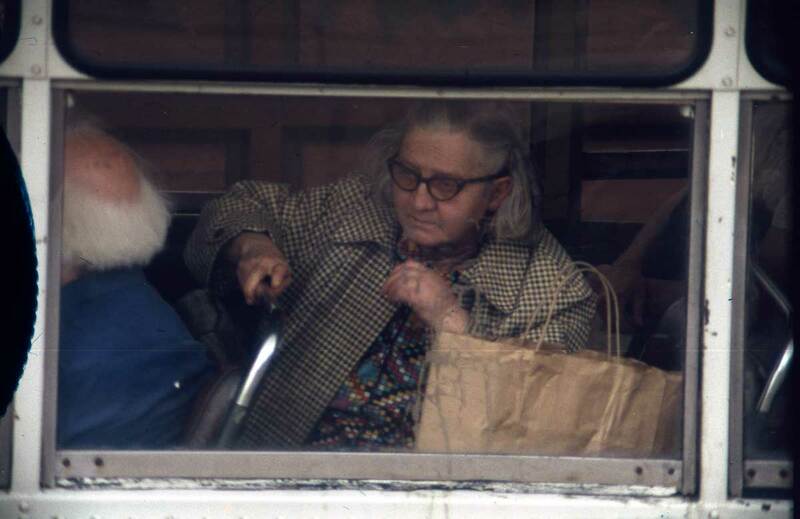 Heading either south or north, Interurban passengers could glimpse the mountain Tacoma passengers called “Tacoma” and Seattle riders called “Rainier.” The route passed, through hop fields, dairy farms, truck gardens, coal fields, orchards, forests, one tunnel and an Indian reservation. It took an hour and 40 minutes to cover the line’s 32.2 miles. Some stops like Burts, Fioraville and Mortimer are now as defunct as the rail itself. Others like Georgetown, Allentown, Renton, Kent and Auburn are still familiar. Another look at the Seattle Tacoma Interurban flashing its third-rail electric way through the Green River Valley. Within the city limits the Interurban ran over municipal rails and attached its trolley poles to electric lines overhead. But as soon as it crossed the city limits, a motorman would lower his pole and hook up with the mysterious third rail, or contact rail, that ran parallel to the other two. This third rail was alive with electricity. School children were regularly warned not to touch it. Chickens, however, were sometimes encouraged to peck at grain strategically sprinkled along its side. Interurban electrocution was a new way of preparing a fowl for plucking. 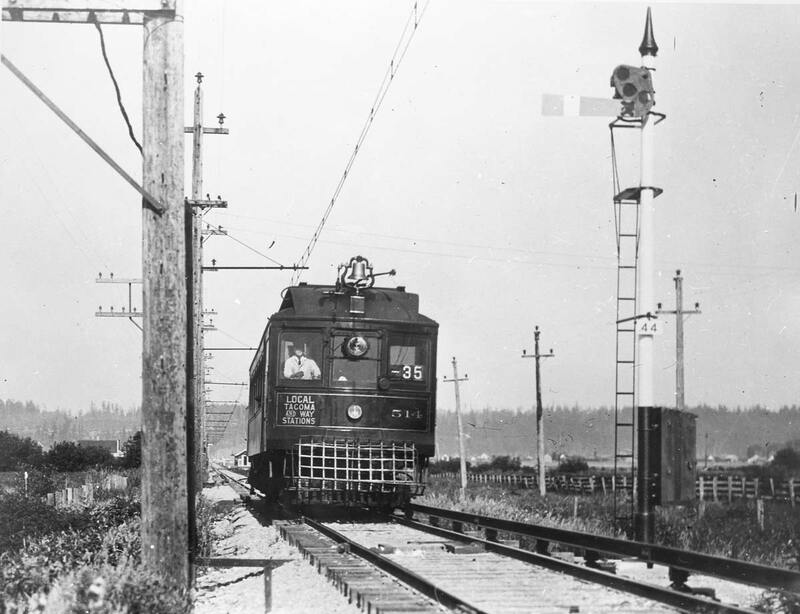 The Seattle-Tacoma Interurban on the way with its 3rd-Rail on the right. 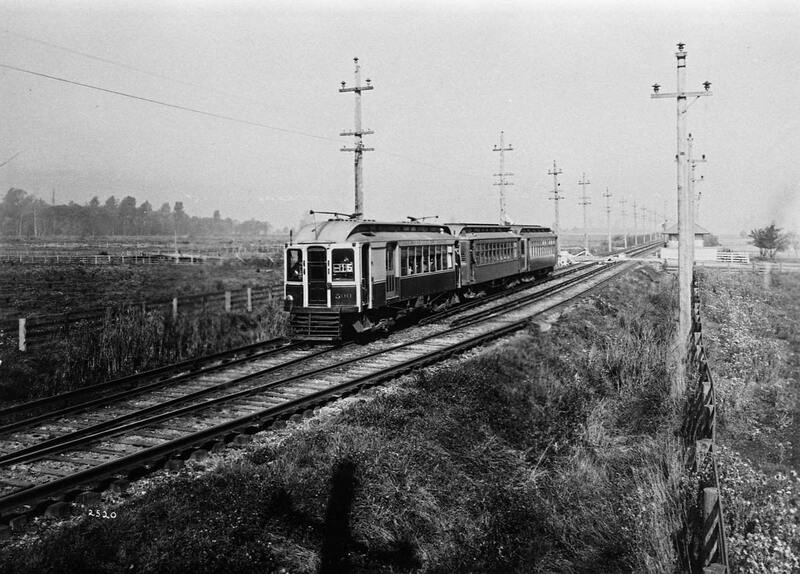 The Interurban hit its heyday in 1919 when more than 3 million passengers used the line. But within nine years the line’s haul dropped to less than a million. By 1917 Highway 99 was passable and the Model-T was commonplace. Service along the third rail was threatened. 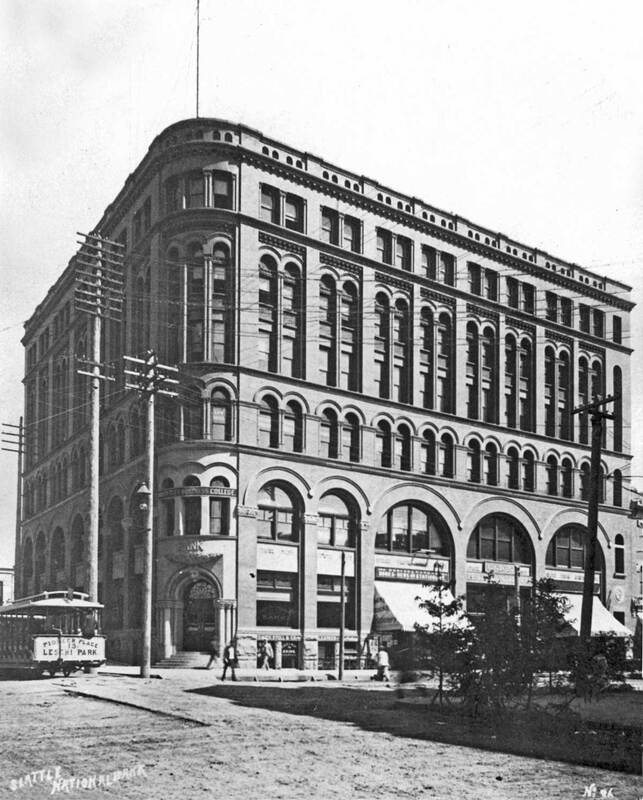 The Interurban Building at the southeast corner of Occidental and Yesler Way on the left. Those may be travelors returning from Tacoma or stops in the valley. Courtesy Lawton Gowey. At 11:30 Sunday evening on Dec. 30, 1928, the last Interurban cars pulled out from Tacoma and Seattle. The Tacoma bound car left from the intersection of Occidental Avenue and Yesler Way (shown above), for 26 years the location of the Interurban Depot. Occidental Ave. looking north from mid-block between Washington and Main Streets. The Seattle Hotel's elegant south facade on the north side of Yesler Way shows across the center of the scene. 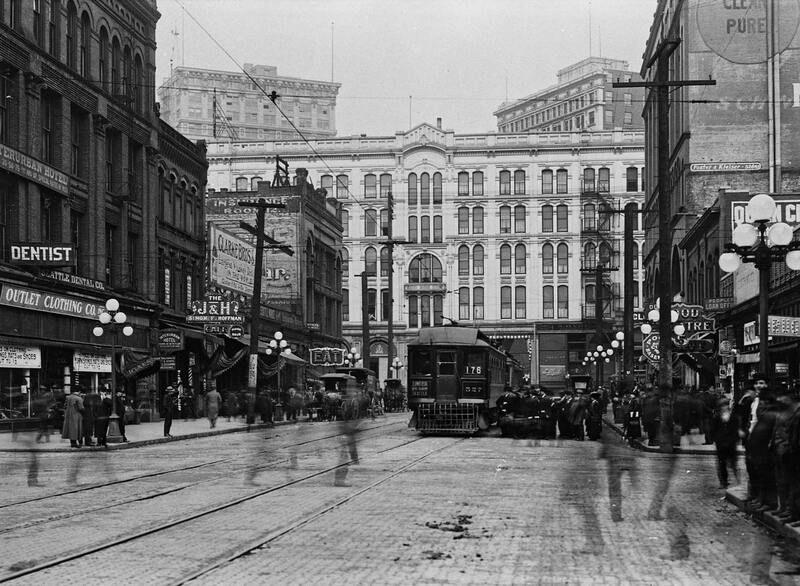 Occidental looking north from Washington Street with the Occidental Building, right of center, the Seattle Hotel, left of center, and a Seattle Tacoma Interurban line-up at the center. What we will ask of the mural cartoon painted on the south facade of the Interurban Building - what about "After Every Meal . . . "? When the Jefferson Car Barn was constructed in 1910 it was the last of the sprawling new garages built for the trolleys in the first and booming years of the 20th Century. The Seattle Electric Company also built barns in Fremont, lower Queen Anne, and Georgetown to augment its crowded facility at 6th and Pine. The Georgetown plant was also the company’s garage for repairing trolleys and, when it came time in 1940-41, also for scrapping them. The finality of that conversion from tracks to rubber is written here in the yard of the car barn with black on black. Fresh asphalt has erased the once intricate tracery of the yard’s many shining rails. The Bothell to Seattle coach - early. Top: Public workers put the finishing touches to a refurbished “grand union” of trolley tracks at the intersection of N. 34th Street and Fremont Avenue. The 1923 view looks west a few feet from the future neighborhood landmark, the “Waiting for the Interurban.” Both views look east on 34th. 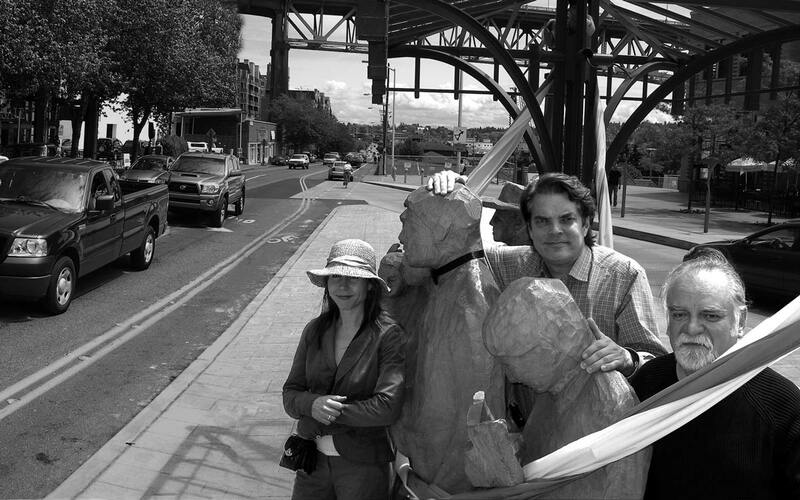 Above: Fremont Historical Society members, and Fremont Art and Transportation walking tour leaders, left to right, Heather McAuliffe, Erik Pihl, and Roger Wheeler, wait with the figures in Rich Beyer’s popular sculpture, “Waiting for the Interurban”. First the transportation. When a sawmill was built at the outflow of Lake Union in 1888 it was already possible to conveniently get to the new mill town from downtown Seattle aboard the Seattle Lake Shore and Eastern Railroad, which was laid along the north shore of the lake in 1887. 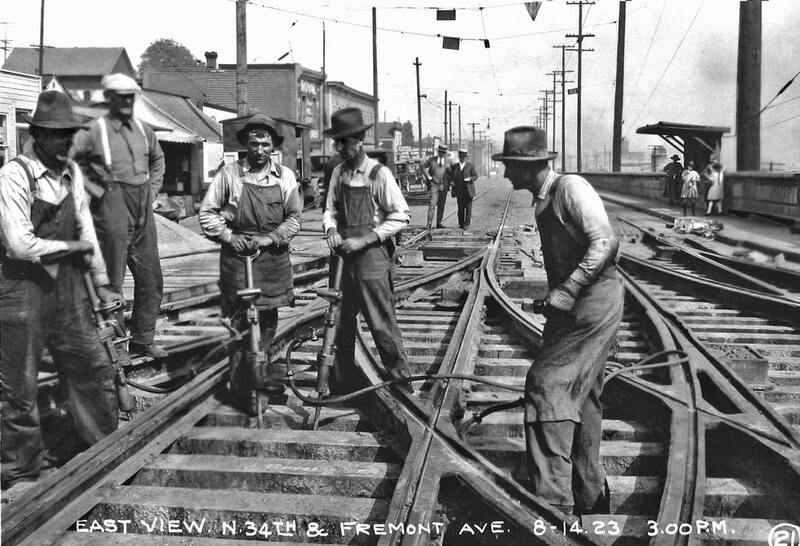 After a trolley above a Westlake trestle was added in 1890 the bridge at Fremont increasingly became the way to get north to the suburbs and remained so until the Aurora Bridge was opened in 1932. Next the art. According to Roger Wheeler, Fremont artist and historian, public art as a Fremont fixation began with the formation in the late 1970s of the Fremont Arts Council. Appropriately its first installation has a transportation theme with some built-in Fremont fun. The figures in sculptor Rich Beyer’s popular Waiting for the Interurban, will have to wait into eternity for they are pointed the wrong way – north. The interurban to Everett never turned east on 34th Street and so would have missed them. Confused or curious? Readers have two opportunities for direct clarification. First join Roger Wheeler for his annual guided art tour of Fremont this coming Thursday, July 26. The tour starts at 7 PM from Beyer’s landmark sculpture. 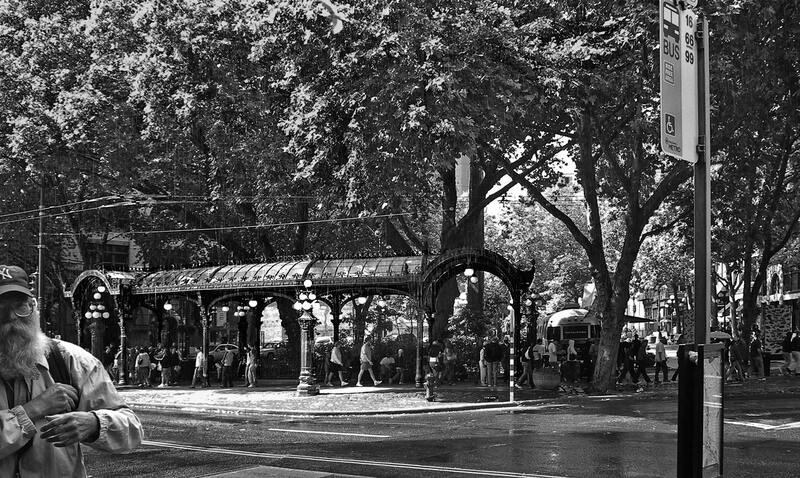 Next, three weeks later on Thursday August 16, the Fremont Historical Society sponsors another neighborhood stroll. This time tour leaders Heather McAuliffe and Erik Pihl begin their instructive Streetcar Walking Tour at 7 PM beside the old Fremont Car Barn at N. 34th Street and Phinney Avenue North. 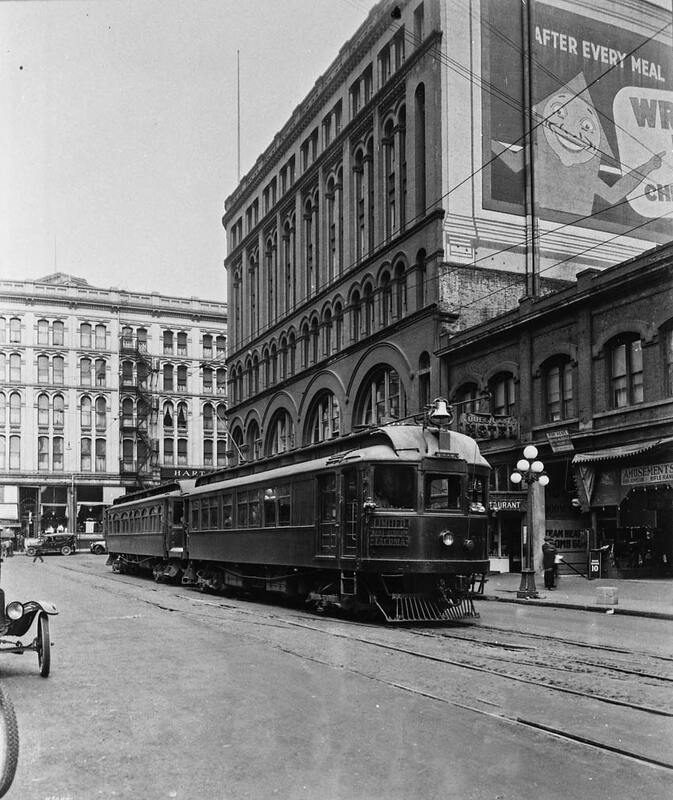 TOP: A “special Seeing Seattle Car” poses in Pioneer Square sometimes after its introduction in 1903 but before the completion of the Pioneer Square Pergola in 1909. Courtesy, Lawton Gowey. ABOVE: The Pergola shines after a sun shower last fall. Both views look north across Yesler Way, through Pioneer Square and up First Avenue. Not so long after the turn-of-the-century consolidation of Seattle’s previously diverse trolley lines the new and more efficient monopoly, the Seattle Electric Company, purchased four “special” cars from the John Stephenson Company of New Jersey. 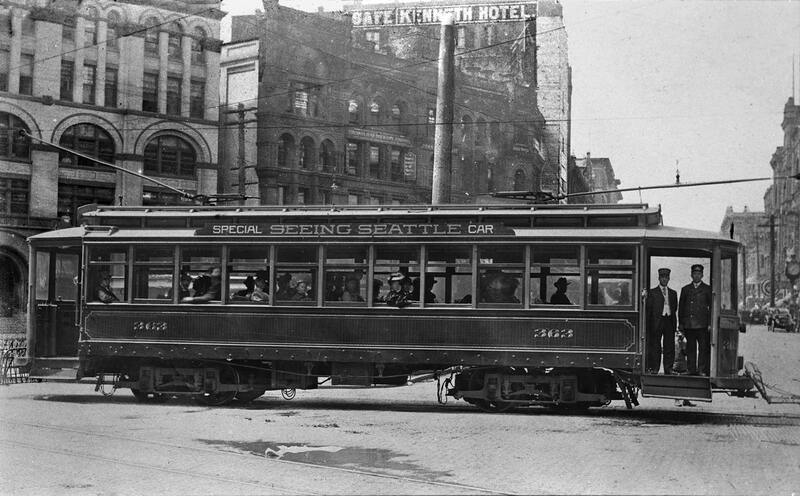 At 46-feet-long, bumper-to-bumper, they were then the biggest of Seattle’s electric cars, and the trolley company’s special plans for them were clearly signed on their sides. The four double-ender trolleys — numbered 362 to 365 — carried both visitors and locals on rail explorations of our then manicly expanding metropolis. Since motorcars were still a rarity in 1903, aside from walking, there were few ready ways to sample Seattle that were not by rail. 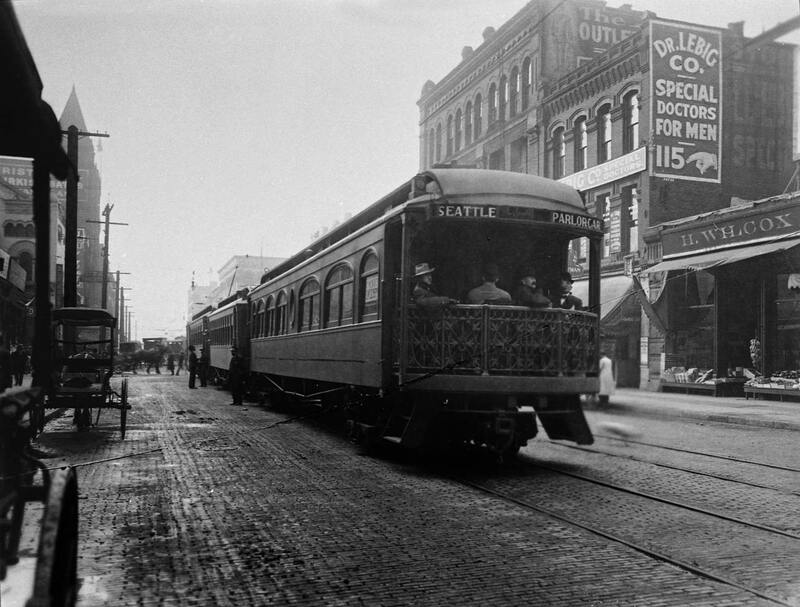 From Pioneer Square the trolley lines reached to Lake Washington, Ballard, Green Lake, the University District, Rainier Valley, all destinations with attractions. So for the purchase of a single ticket a customer could explore almost every corner of the city, including, beginning in 1907, West Seattle. Since there was no competing cacophony of motorcars, to be heard by their passengers the conductor-tour-leaders had only to bark above the creaking of the long cars themselves as they rumbled along the rails. 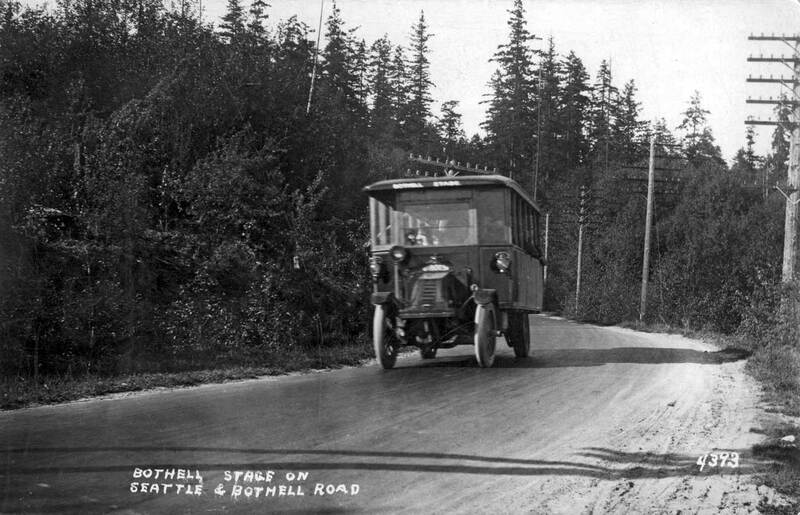 By 1907 these “Special Seeing Seattle Cars” were not the only tour in town. There were then enough paved streets and even boulevards in Seattle to allow open busses to go anywhere hard tires and spring seats could comfortably carry their customers. These sightseers were also regularly photographed as a group and many among them would purchase a print of their adventure either for a memento or message. 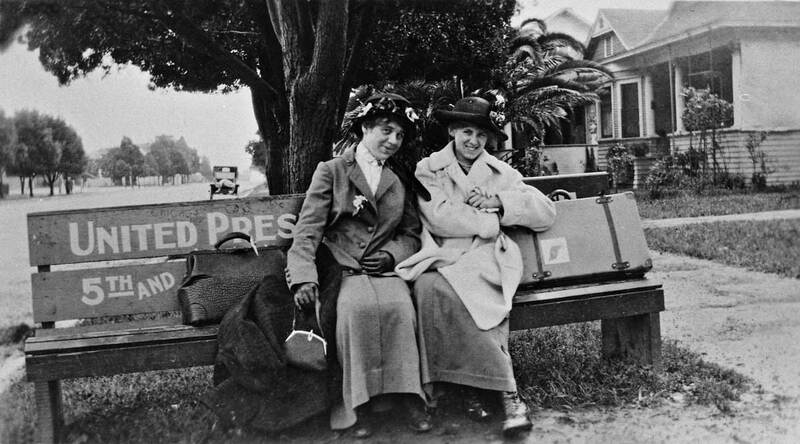 The group portraits were ordinarily printed on postcard stock and of the many sold some carry handwritten flip-side expressions of the joys of seeing Seattle. An early municipal bus extending service to Ballard and Sunset when trolleys missed much of the neighborhood. A most impressive double-decker posing at the front door to the city's new Civic Auditorium ca. 1931. 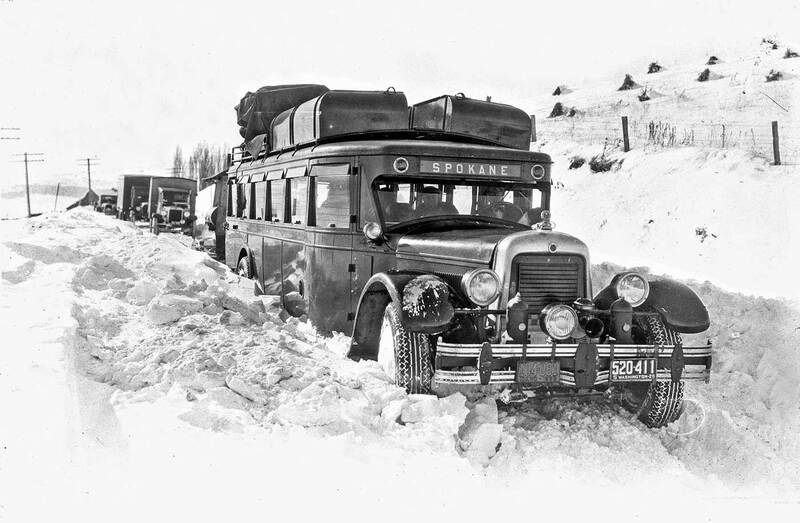 Bound for Spokane or Snowbound, 1929. Muni. buses wait on Pine Street near Broadway Ave. with an earlier service to Magnolia. Cornish School, at its first location at the southeast corner of Broadway and Pine, is in the background. While the subject here is evidently the two new White Motor Company (WMC) buses in the foreground we also catch above them, center left, a glimpse of Cornish School. Below the eaves the sign “Cornish School of the Arts” is blazoned and to either side of it are printed in block letters the skills that one can expect to learn in its studios: “Art, Dancing Expression, Language.” From its beginning in 1914 Cornish meant to teach all the arts and the whole artist. The official Curtis number (38871) for this image indicates that it was probably photographed late in 1919, or two years before Cornish moved from the Booth Building here at the southeast corner of Broadway Avenue and Pine Street north a few blocks on Capitol Hill to another Spanish-styled structure, the school’s then new and still used home at Roy Street and Harvard Avenue. 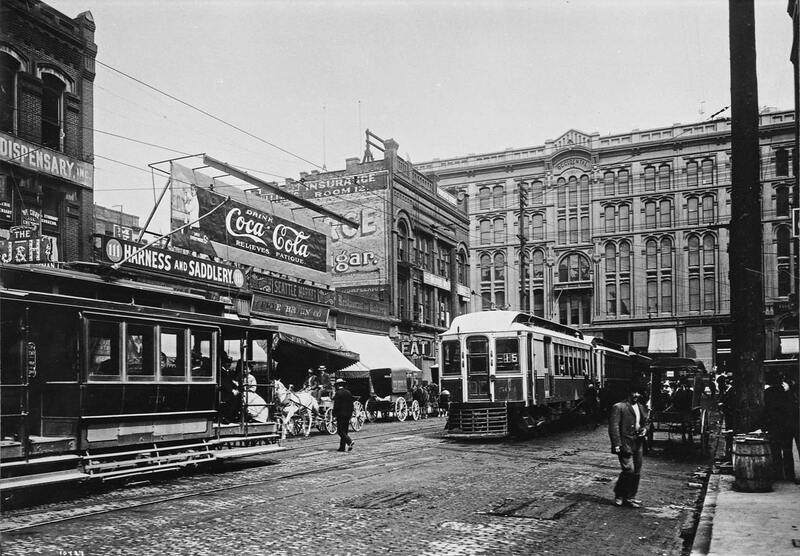 When the city took public control of all the streetcars in the spring of 1919 they purchased a dangerously dilapidated system at a price so dear it precluded most improvements. 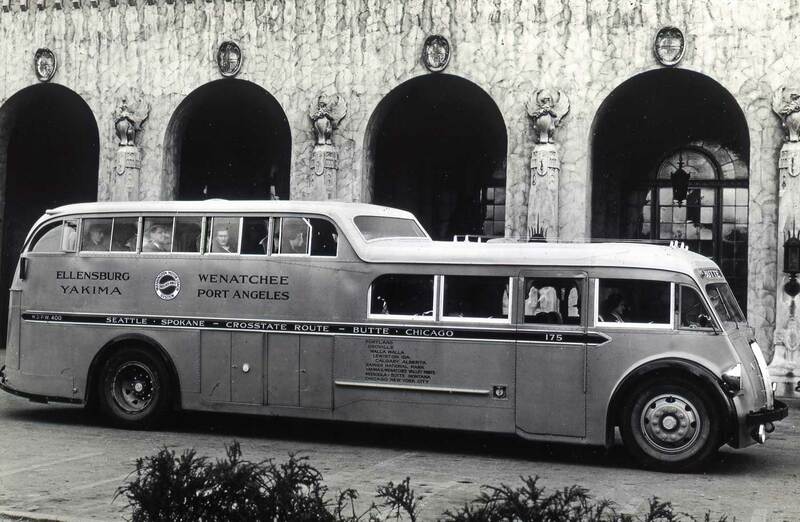 The few exceptions included these buses that were purchased to reach parts of the city that the old private trolley system did not service. 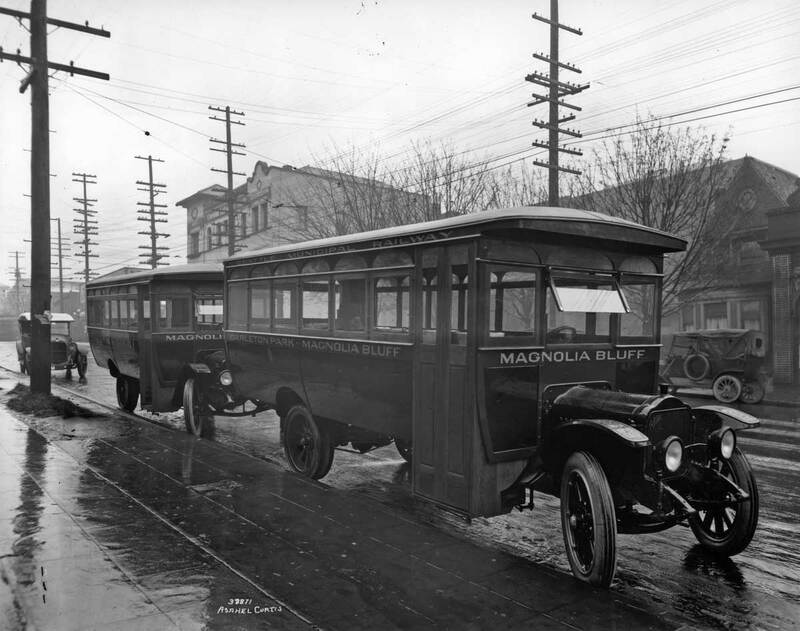 These buses are signed for Magnolia where most of the developing neighborhoods were not reached by the street railway line that ran to the front gate of Fort Lawton. Thomas White began making sewing machines in Massachusetts in 1859. He was still around in 1901 when his company made its first steam-powered automobile in Cleveland. Gas powered trucks were added in 1910; buses followed. Vancouver B.C. also purchased WMC buses to service the Grandview area to the east of that city. The best-known and longest-lived White buses were the red ones used for narrated tours at Glacier National Park. They were a park fixture (moving ones) until retired with “metal fatigue” in 1999 after 64 years of continuous service. Heading downtown early in the morning with a full load of workers and shoppers car 721 jumped the track where Woodland Park Avenue still curves through its intersection with 39th Street. The speeding car fell from its tracks into a sturdy telephone pole (left of center) that opened the car roof like a can of cheap pop. Of the more than seventy passengers injured seven were seriously so and one of these died the following day. 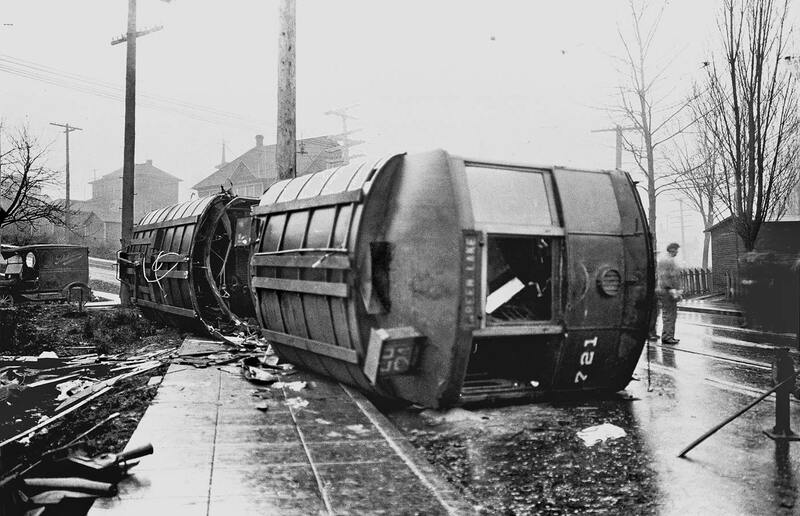 The wreck was “appalling” because it was an accident made inevitable by the circumstances surrounding the sale of the system. The Seattle Electric Company sold the dilapidated line to a Seattle mayor, Ole Hanson, who purchased it at such an inflated price that no funds remained for repairs. At the time Mayor Hanson was more interested in whatever bold moves might make him an attractive candidate for the American presidency. The Seattle Times’ same day front-page story on the wreck leads off with an ironic listing of conflicting voices. 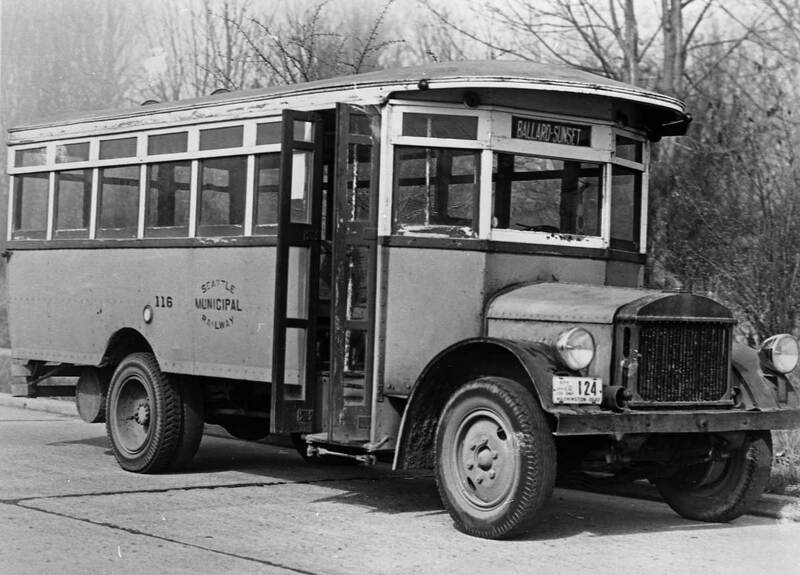 Councilman Oliver Erickson described the brakes and rails of the system as in “rotten condition.” Thomas Murphine, superintendent of public utilities, described them as “in perfect shape” but that the driver was “new and inexperienced.” For his part Motorman M.R. Fullerton claimed that the brakes would not work and that “I used everything I had to try to stop the car before reaching the curve.” Fortunately for Fullerton it was the bad brakes excuse that – unlike his car 721 – ultimately held sway. 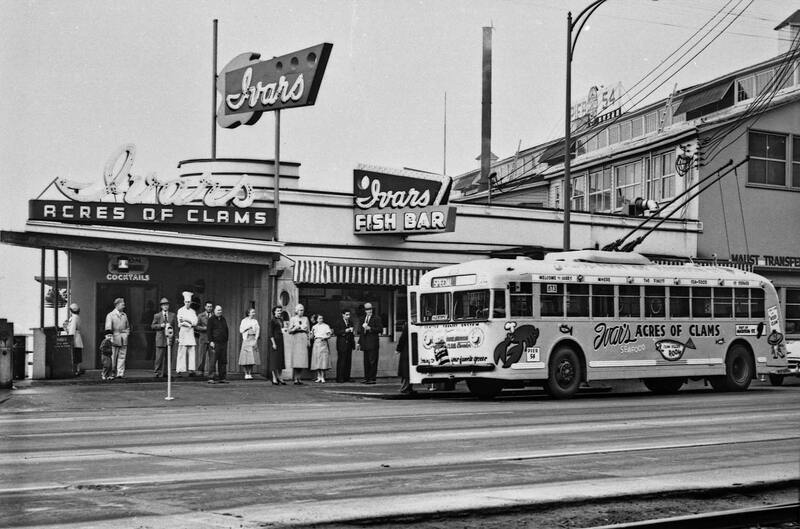 A trackless trolley at Pier 54, ca. 1950. In all-black (it seems) the short Ivar appears just left of the center of the posing group. His head chef Clyde is in all white and much much taller. A postcard recording of Westlake taken from the Josh Green building at the southwest corner of 4th and Pike. Orange buses here mix with tracked trolleys, also orange. Fire engines stand guard. A snapshot found in a photo album filled with photographs by Boyd, a photographer who arrived in Seattle briefly before the city's "Great Fire" of 1889. The woman on the left is his granddaughter. 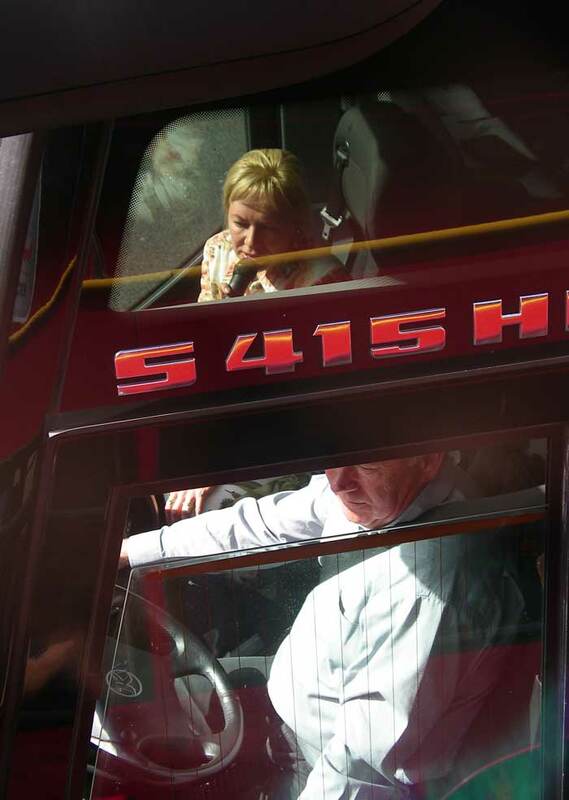 It seems that she and a friend may be starting a long journey with a ride on a local bus. 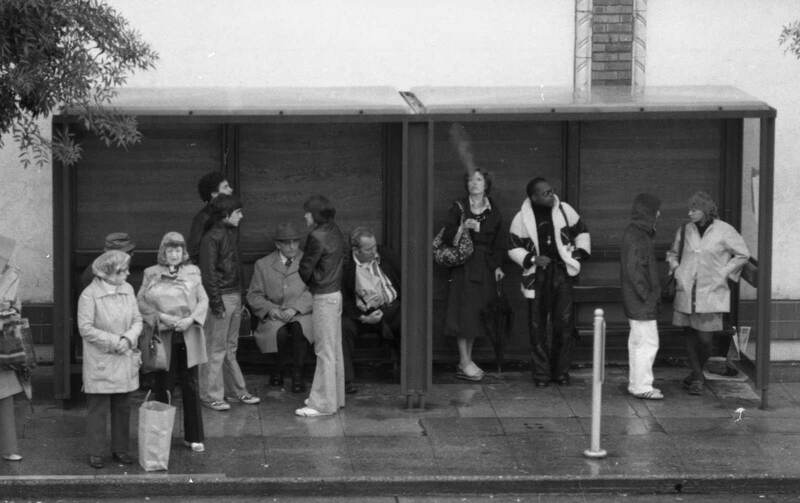 Unidentified couple and bus shelter recorded by Frank Shaw in 1977. NOTE: This from Gam - an ID! A minor mystery solved: The unidentified bus stop in Frank Shaw’s picture from 1977 looks to be behind the Hearthstone on Woodlawn Avenue, looking west from 1st Ave NE towards Sunnyside Ave N. YES GAM that certainly is one of those fortress-like Hearthstone railings. Here follow three of several thousand photographs I took from the kitchen of a “pad” atop Peters at the southeast corner of Broadway and Republican, on Capitol Hill. Some of these were posted in the city’s buses. The project was fun, easy, and relatively inexpensive. I bought roll film, spooled it and did my own darkroom work. For color I purchase 35mm motion picture negative film, spooled it, and then rejoined the rolls to be developed very inexpensively (for color) as motion picture film. Neither on Capitol Hill nor in the mid 1970s but in London in 2005 from a double-decker bus into another bus, and one with a tour leader. 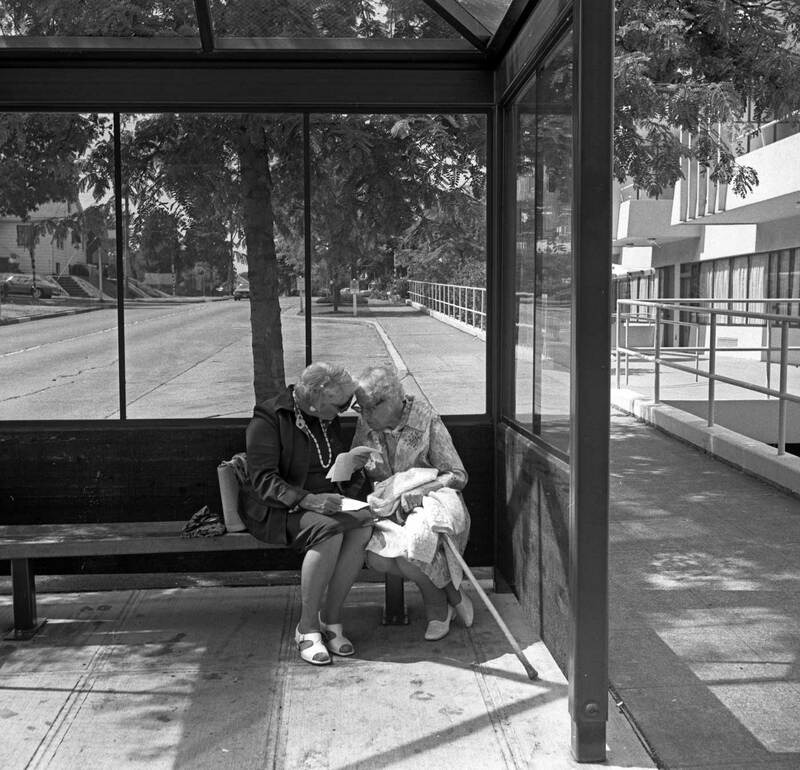 A minor mystery solved: The unidentified bus stop in Frank Shaw’s picture from 1977 looks to be behind the Hearthstone on Woodlawn Avenue, looking west from 1st Ave NE towards Sunnyside Ave N.
That’s not the Interurban building, nor are we looking south on Occidental. 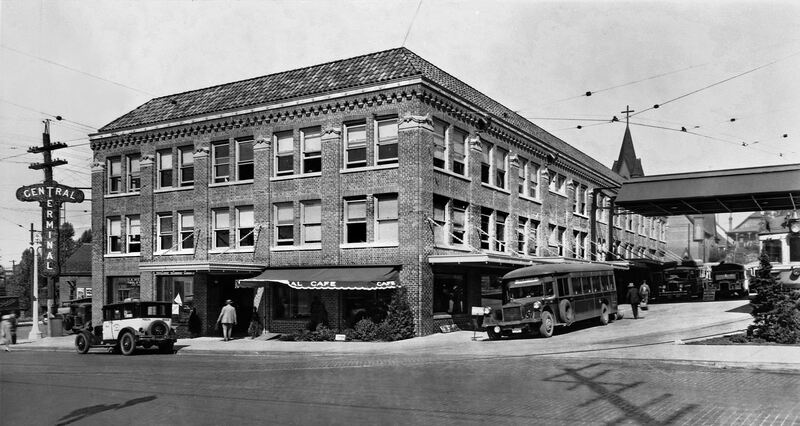 Compare the details of the the building pictured with the Interurban building in the two photos posted above. Compare the entries. The Interurban has classic Romanesque Revival clusters of columns at the side of the corner entry from which spring a round headed Romanesque arch capped with a lion’s head keystone. No such feature exists on the photograph in question. 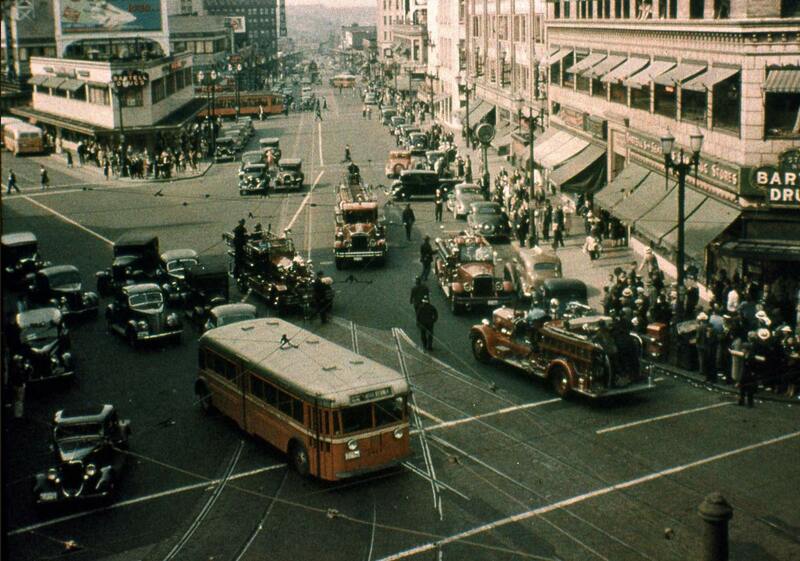 What is pictured is the old Olympic Block and the view is down First Avenue. The entry of this building has separate freestanding columns holding up a horizontal lintel. Further evidence that what is pictured is the Olympic Block is the carved relief in the spandrels between the windows of the second and third floors which the Interurban building doesn’t have. And while the Olympic Block pictured is gone, the two buildings beyond are still there on First Avenue. Another good picture of the Olympic Block from when it was home to the Northern Pacific Railway ticket office can be found in The Asahel Curtis Photo Collection in the Special Collections Department of the Library at the UW. Thanks for the ID. I’ll put it in the main text. That will be one of the three most nose-wetting mistakes I have every made with pix I.D. Truth was that at 2am my head was falling towards my lap when I pulled it from a file misspelled “trollies” as an answer to my need for an occidental pix without having to go into my copy negatives to scan one. I did’nt look at it. It is obviously of First S. My my. I need a late night assistant holding a long ruler over me. I’ll make the change in the text, and then go to confession. Also, I remember the old Bartell’s drug store in the triangular building on Pine between 4th and Westlake, but was surprised to see another Bartell’s across Westlake in the first floor of the Seaboard Building. I moved to Seattle in 1950 as a boy of 11 years. We traveled to Seattle from California by Greyhound Bus and debarked at the South Terminal, a block south of Yesler Way on 2nd or 3rd Avenue. Can anyone say exactly where the South Terminal was located? I have a half dozen professional quality photos of the Jefferson Street Barn & buses with drivers circa 1920. Hugh McKinney was one of the drivers in the photos: Lake Washington & Madrona Park, Mt. Baker Park. I also have one of the Jefferson Street ball team. They are all digitized. I’ve posted some at my Kaiser Wilhelm facebook account.